Location, patience, and timing are the ingredients to outwitting wary pronghorn. 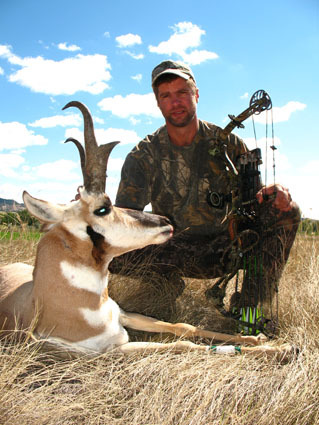 Pronghorn eyesight is legendary for frustrating bowhunters. The frustration of getting in close enough for a shot is compounded by flat terrain offering scant cover. For the prairie bowhunter water levels the playing field, as speed goats must drink daily to survive. This makes finding productive watering sites priority one. Typical water includes dirt-dam ponds, steel stock tanks, windmill troughs, or natural springs. While scouting, find a vantage from which to observe movements, or trace game trails leading to water. And don’t overlook subtle water like spring seeps or a dip in the road collecting water during thunderstorms. Once productive water is discovered, the next logical step is to build a viable hide. Windmill towers offer easy setup. Add 2x4s and ratchet straps as needed to assure safely and security. Pop-up blinds make good sense; place them well ahead of season to let goats get used to them. Add steel T-posts at corners and cross sections of barbed wire to protect against prairie winds and especially itchy cattle. Hand-dug pit blinds are more standard in pronghorn country. They provide concealment and comfort during sweltering days when waterholes are most productive. Proper pit blinds involve plenty of hard work, but also ultimate reward. Don’t forget to ask permission before digging on private lands, and always fill pits when you’re done hunting. Consider prevailing breezes and available cover before you start. You will need a pick and shovel. A heavy digging bar is useful in rocky areas. Dig deep enough so your bow handle just clears its front lip while sitting and at full draw. Make your pit wide enough to allow bow clearance all around, and include a seat at the rear. Pile excavated soil behind the blind to create a backdrop and anchor for camouflaging vegetation. After your pit is completed, construct a frame of lumber or tree limbs. Make the roof high enough to avoid bow interference while shooting. Cover this with chicken wire, then burlap. Layer dirt to anchor the works and hold disguising brush. The goal is a dark cave that conceals movement and keeps you cooler during hot days. Finish by adding brush and grass around the pit to blend with natural landscape. Guarding water is an all-day proposition. Take a lunch and plenty of electrolyte-infused fluids. It will get hot, especially inside pop-ups. Treestand sitters should use stand umbrellas and plenty of sunscreen. Pronghorn might arrive any time throughout the day, so stay on your toes. Shot timing is critical on jumpy pronghorn. It is best to wait until a buck’s head is down and the neck muscles are working. Thirsty pronghorn gulping water are at their most vulnerable. Beware, there will be many false starts, as goats jerk their heads up repeatedly before settling in to drink. Once those neck muscles begin working, you have about 30 seconds to get off a shot. Take your time, but don’t dawdle. The hot days of late summer assures pronghorn sightings throughout the day. In quality hunting areas you might actually become choosey, waiting for the buck of your dreams. Invest that extra effort in scouting a productive watering site, in assembling a top-notch blind, and this dream can become reality this season.